What were the first games? People have played games in Africa since before they were really even people, and some of these games are unchanged from hundreds of thousands of years ago. Chimpanzees play tag, and probably the earliest people did too. Early African people also made and used lots of different kinds of toys. 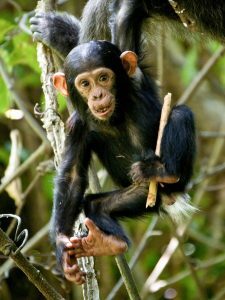 Young chimpanzees seem to carry around sticks as doll babies, and probably the earliest people did that, too. One very early toy used a small flat piece of wood or bone or clay with two holes in it. You put a leather thong or a piece of vine or a string through each hole and spun the string to wind up the toy; then when you pull the strings out tight the disk spins around and makes a buzzing noise. Sometimes people carved pictures of animals on both sides of the disk. Then when the buzzer was spinning it would look like the animal was running. These were very early movies! In historical times, kids in Africa played jacks with rocks, as they did in other countries and as they do today. There’s a long history of games without any equipment at all. They ran races and played hide and seek. Kids scratched lines in the dirt to play jumping games like hopscotch. Or they got long vines or a rope to play jumprope. Another kind of early African toy was marbles: Kids played marbles, with stones or little balls of clay, or nuts. They played hacky-sack too. They played cats-cradle with string. African kids liked to play singing and rhythm games too. For instance, they might stand in a circle. The leader would clap a rhythm and then the others would clap the same thing, and then the leader would clap something harder, more complicated, and the others would try to copy it. You can get your own Mancala game to play! When did people start to play board games? People in early Africa played board games. The best known board game from Africa is Mancala. You can play Mancala just by making two rows of little holes in the ground, and using little rocks or seeds as the playing pieces. Many people did play African board games that way, and possibly people have played that way since prehistoric times. 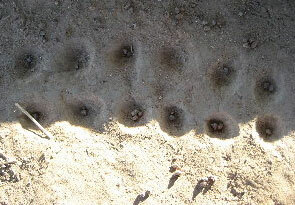 People often used farming words like “sowing” to describe how you moved in Mancala, so maybe the game got started about the same time as farming, about 8000 BC. What’s the earliest Mancala board we still have? 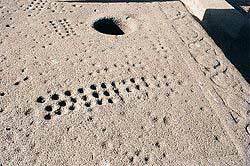 The earliest actual Mancala board that we still have today comes from Axum (modern Ethiopia), where somebody cut the game board into stone about 600 AD. People took Mancala strategy very seriously in Africa. They debated and studied Mancala strategy the same way people in Europe and West Asia played chess, and people in China played Go. Senet was another early African board game. The game of Senet came from ancient Egypt. You can find out more about the rules of Senet on our page about Egyptian games. Ancient Egyptian people, people across North Africa, and people in Sudan and Ethiopia also used square dice to play gambling games. African people traded more and more with other places. They learned new games from the people they met. By around 300 BC, people in Africa were playing the West Asian game of backgammon, with dice. About 700 AD, they started to play the Indian game of chess. More than two hundred years after that, about 950 AD, they started to play card games with playing cards from China. All of these games probably crossed the Sahara into West Africa and Central Africa with camel caravans starting in the Early Middle Ages. Looking for more sources to cite? Check out David Parlett’s interesting article and suggested reading. Did you find out what you wanted to know about the history of games and toys? Let us know in the comments! Cite this page: Carr, K.E. Early African Board Games and Toys – History of Games. Quatr.us Study Guides, May 18, 2017. Web. April 20, 2019.